Seminar on Role of Partnerships with Academia and Research Institutions of Bangladesh in delivering the Sustainable Development Goals held on 06-12-2017. 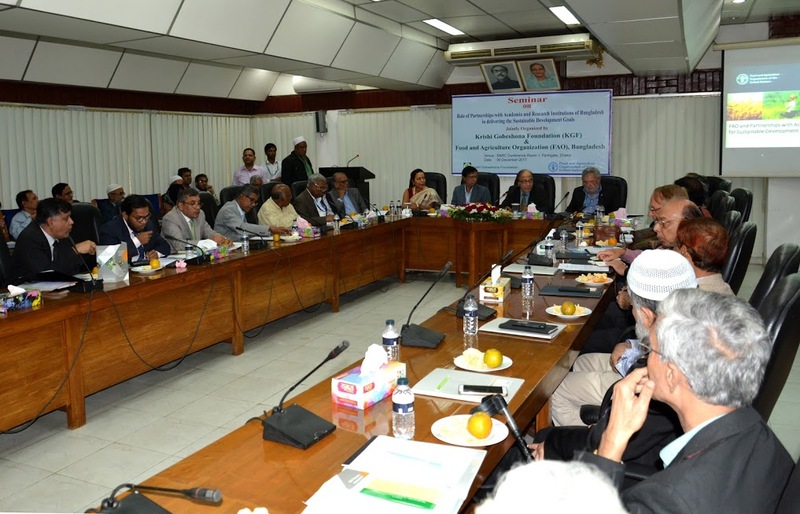 Krishi Gobeshona Foundation (KGF) in association with Food and Agriculture Organization (FAO), Bangladesh was organized a seminar on “Role of Partnerships with Academia and Research Institutions of Bangladesh in delivering the Sustainable Development Goals. The seminar held at BARC Conference Room-1 on 06 December 2017. Ms. Kakoli Ghosh, Coordinator of Partnerships, Food and Agriculture Organization (FAO), Rome, Italy delivered a keynote paper on “Role of Partnerships with Academia and Research Institutions of Bangladesh in delivering the Sustainable Development Goals in the seminar”. Around 90 (ninety) participants including Eminent Scientists, Head of the NARS Institutions, Civil Society, Professors from all Agricultural Universities and University of Dhaka, Extension Agencies, former KGF Experts, KGF, Private Sectors, SAC, FAO, BRAC, CGIAR Organizations, WorldFish, PKSF, SME Foundation etc. in Bangladesh were attended the occasion. Dr. Paresh Chandra Golder, Member-Director (Planning & Evaluation), Bangladesh Agricultural Research Council was present as the Chief Guest and Mr. David Doolan, Deputy FAO Representative in Bangladesh was present as the special guest in the seminar respectively. Dr. Kazi M. Kamaruddin, Program Director (Livestock & Fisheries), KGF welcomed the all participants of the program. ¬ Dr. Wais Kabir, Executive Director, KGF and former Executive Chairman, Bangladesh Agricultural Research Council presided over the seminar nicely. The speaker Ms. Kakoli Ghosh delivered a very comprehensive dialogue and emphasized on the SDG goals with a special focus on SDG-2 (Zero Hunger) and stressed on the need for partnerships development not only between academia and research institutions but also with other stakeholders like private sectors, international associates, extension agencies, civil society etc. She urged that role of partnerships with all stakeholders depends on the good governess for any country. The presentation was very much appreciated by the audience. Copyright © 2019, Krishi Gobeshona Foundation (KGF), BARC Complex, Farmgate, Dhaka-1215, Bangladesh, Email: kgf-bd@live.com, phone: +88(02)9111041, Fax: +88 (02) 58153872, All Rights Reserved.